Too busy to read the full article? Click here to listen to the audio version of I’m not too tired to stuff my face. Altered salience network connectivity predicts macronutrient intake after sleep deprivation. The less we sleep, the more we’ll weigh - that’s what the observational evidence seems to indicate, and some randomized controlled studies have backed this up. But what causes these weight changes at the biological level? Recent research into the sleep-deprived brain has started to answer this question. One clue comes from brain scans of sleep-deprived subjects, which have shown increased activity in response to food in areas of the brain involved with reward, such as the putamen, insula, and nucleus accumbens. Another brain area, the anterior cingulate cortex (ACC), showed increased activity in subjects who were totally deprived of sleep when shown pictures of food, and the activity correlated to how desirable they found the food to be. It seems these brain regions respond more strongly to food when sleep-deprived. It also turns out that similar regions of the brain also respond to food abnormally in obese people. For instance, one study found increased activation in the ACC, putamen, and insula as well as other brain regions in response to pictures of high-calorie foods in obese people, compared to normal-weight individuals. And the sum of recent evidence suggests that there are differences in the brain activity of obese and normal-weight people. Many of the brain regions that activate more strongly in response to food stimuli in sleep-deprived and obese people have something in common: they are part of what’s known as the “salience network.” The role of the salience network is to take stock of how the body is doing as a whole, and guide behavior to make things better if something is amiss. It’s the system that draws attention to something that might be useful in your environment, generates some of the impulse to act, and doles out a reward when what was desired is obtained. Could sleep deprivation activate the salience network and make food, or at least certain kinds of food, more palatable? That’s what this study intended to explore. There’s a wealth of evidence to suggest that sleep deprivation is associated with obesity. 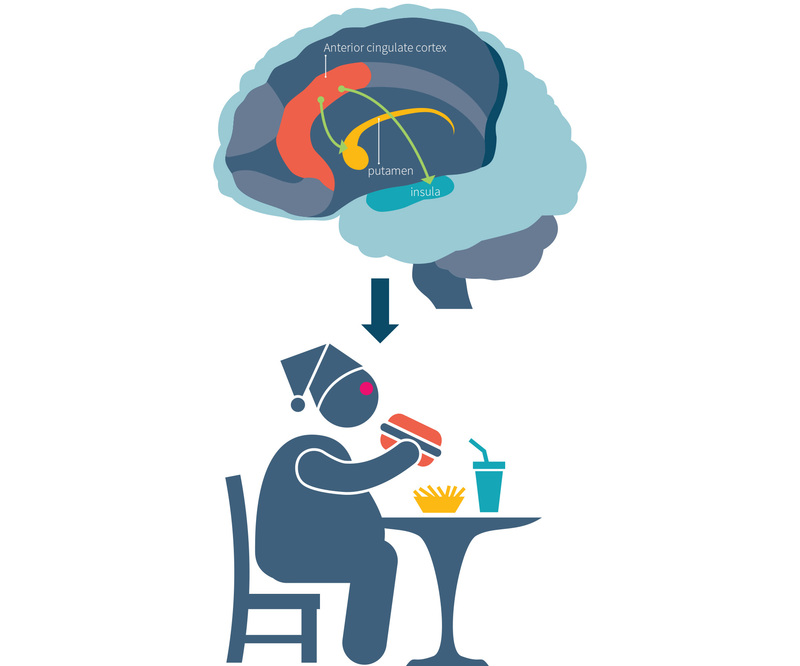 Parts of the brain, like the anterior cingulate cortex (ACC), putamen, and insula over-activate in response to food stimuli in both obese and sleep-deprived people. These parts of the brain are known as the “salience network,” which notices things in the environment and drives action to obtain them as needed. This study explored how the salience network was associated with food intake after sleep deprivation. Forty-six healthy adults between the ages of 21-50 were recruited for this study. All participants were either of normal BMI or overweight. None were obese. They were also all nonsmokers, and were screened to make sure that they had normal, healthy sleep patterns. The study protocol is summarized in Figure 1. To start off the study, all of the participants had a baseline functional MRI (fMRI) of their brains done after being allowed nine hours of bedtime for sleep. The day after, their caloric and macronutrient intake was measured. Everybody was allowed to eat whatever and however much they wanted from a provided menu. Since all the food was provided to the participants, the macronutrient and caloric intake could be accurately assessed. The participants were then randomized to either a total sleep deprivation (TSD) condition or a control condition. The participants in the TSD group weren’t allowed to sleep at all for one night, whereas the control group was allowed to sleep for up to eight hours. The TSD group was allowed to do pretty much whatever they wanted to while awake, except exercise (which no one was allowed to do during the course of the study). The two groups then underwent a second fMRI. The following day, macronutrient and caloric intake was measured again. The main parameter that the fMRIs were measuring was something called “resting state functional connectivity.” “Resting state” means that the fMRIs were done while the participants were not doing anything besides laying there and having their brains scanned. Sometimes, fMRIs are done while the participants are performing tasks. This was not the case here, hence “resting state.” “Functional connectivity” is the study of how activity in different parts of the brain are correlated. If one part of the brain tends to be active at the same time as another part of the brain, they are both functionally connected. In short, the fMRIs were used to see how different parts of the brain communicated with each other while at rest. Differences in functional connectivity between the sleep-deprived subjects and the controls were examined to see if there was any relationship to macronutrient intake. Active parts of the brain need oxygen and sugar carried by the blood in order to function. When a part of the brain becomes more active, the body meets the increased demands of the active neurons by providing more oxygen- and glucose-rich blood to that part of the brain. Functional magnetic resonance imaging uses this change in blood flow in order to see what parts of the brain are active. It turns out that oxygen-saturated hemoglobin behaves differently than oxygen-depleted hemoglobin when placed in a magnetic field. When oxygen-rich blood rushes in to feed active parts of the brain, we can see this by applying some strong magnetic fields (as seen in Figure 2, along with some fancy computational techniques) and infer which parts of the brain are functioning. Healthy participants with BMIs in the normal or overweight range were randomized to sleep for eight hours in a night or undergo total sleep deprivation (TSD) for a night. Both groups were allowed to eat whatever they liked whenever they liked, and their macronutrient and caloric intake was measured. Brain scans using functional magnetic resonance imaging (fMRI) were performed at baseline and afterwards to measure whether the communication between different parts of the brain (the “functional connectivity”) was affected by sleep deprivation and if they correlated to macronutrient intake. 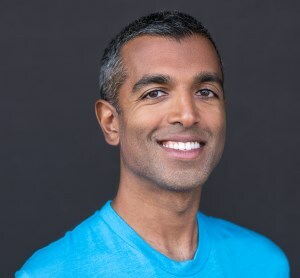 The participants randomized to TSD did not differ from the controls in any measurements at baseline, including their macronutrient and caloric intake. This is good, since any differences between them after the intervention are more likely to be attributable to sleep deprivation than statistical accident. The TSD group consumed as many calories on the day after being deprived of a night’s sleep as they did at baseline (when they were allowed a full night’s sleep) on average, which was about 2250 calories. However, the TSD group did consume a higher percentage of those calories as fat and ate significantly fewer carbohydrates compared to their baseline day, when they were allowed to sleep. Overall, about 4% more of the total daily calories came from fat after sleep deprivation as compared to baseline.The amount of protein intake was not different in the TSD group between baseline and the day after sleep deprivation. There were no differences in macronutrient or caloric intake percentages in the control group between the two days. However, the TSD group also ate about 900 calories worth of food while awake. The control group didn’t eat anything. After all, it’s hard to eat when you’re asleep (although it does happen sometimes). This means that the total caloric intake for the TSD group was higher, and is completely attributable to nighttime eating while staying awake. Certain brain changes were seen to correlate to the changes in percent fat and carbohydrate intake in the sleep-deprived participants. Specifically, functional connectivity between the ACC and putamen (shown in Figure 3) was positively correlated to increased fat intake and decreased carbohydrate intake, and unrelated to protein intake. A similar correlation was observed with functional connectivity between the ACC and anterior insula. No other correlations between functional connectivity and macronutrient intake were seen, and no changes in FC were seen in the control group. More calories were eaten after sleep deprivation in the TSD group than at baseline, when participants were able to get a full night’s sleep, due entirely to eating while they stayed awake at night. They ate a similar amount of calories during the day after sleep deprivation as they did after a full night’s sleep. However, they ate a higher percentage of calories as fat and a lower percentage as carbs compared to the day after they were able to sleep. Functional connectivity between the ACC and the putamen and insula (parts of the “salience network”) correlated with increased fat and decreased carbohydrate intake. This study speaks to two things: how total sleep deprivation affects caloric and macronutrient intake (at least in the short term), and how sleep deprivation may affect the brain, which leads to these changes in macronutrient intake. In this study, sleep deprivation led to increased overall caloric intake of close to 1000 calories on average. Perhaps somewhat surprisingly, though, this increase in calories was entirely attributable to nighttime eating. At baseline, when the TSD group was allowed a full night’s sleep, they ate as many calories during the day as they did when they were sleep deprived. However, they took in a higher percentage of those daytime calories as fat, and fewer as carbs, when sleep-deprived. Why did the TSD group eat during the night? Boredom is a possibility, but not a very strong one, as the sleep-deprived subjects were allowed to do whatever they wanted (read, watch TV, play games, etc.) except exercise. So it’s hard to say what mind state led them to eat at night. This study didn’t address the psychological reasons behind their eating. However, it did take a look at neurological reasons. What do the fMRIs tell us about this? In terms of night eating, not a whole lot. Measurements weren’t taken to see brain changes that led to night eating. However, there were correlations between changes in functional connectivity and macronutrient intake the day after sleep deprivation. Specifically, functional connectivity between the ACC and the putamen and the ACC and the insula correlated with increased fat intake. However, unless you’re a neuroscientist, that probably doesn’t make things much clearer. So, let’s break it down. Recall from the introduction that the ACC, insula, and putamen are all part of what’s known as “the salience network,” whose job is to identify things that the body needs. Specifically, the ACC is known to be activated when the body is challenged physically, and helps guide behavior to overcome the obstacle. Sleep deprivation is one such bodily challenge, and has been shown to increase ACC activity in response to food in previous studies. The insula is known to play a role in labeling objects and aspects of the environment as helpful and calling them to attention. Increased functional connectivity between the ACC and insula seems to indicate that the ACC senses a stress (sleep deprivation) and asks the insula to bring attention to potential solutions. Meanwhile, the putamen is known to also play a role in the detection of salient stimuli like the insula, but in addition may play a special part in anticipating the stimulus. In a separate study, sleep deprivation has been shown to enhance the reward reaction of the putamen and insular cortex to positive experiences. Sleep deprivation causing an increase in functional connectivity between the ACC and putamen implies that the ACC is asking the putamen to be on the lookout for and anticipate positive stimuli, which would then be rewarded more than usual if obtained. In short, the ACC senses stress (sleep deprivation) and recruits the putamen and insula to look out for and anticipate rewarding stimuli. One thing that the ACC and insula find rewarding is dietary fat. We know this because the ACC and insula are known to activate after oral fat intake. This is necessary background to understand what happens in the brain when it is sleep deprived, and why it leads to increased fat intake. The ACC, under stress from lack of sleep, asks the insula and putamen to keep a sleepy eye out for anything that may help the body in this time of need. The insula motivates behaviors to achieve these goals, and the putamen creates anticipation and rewards obtaining the stimuli more than usual. Fat is a stress reliever for the tired brain, which may explain why sleep-deprived people ate more fat. Note that these results and the story revealed by this study may not extend to everybody. The participants in this study were all healthy, somewhat young (no older than 50), and were either of normal weight or overweight. The findings of this study may not extend to children, the elderly, sick people, or obese people. Also, keep in mind that this study was done during total sleep deprivation, and the results may not completely carry over to partial sleep deprivation over long stretches of time. Normal weight or overweight and otherwise healthy individuals ate close to 1000 calories at night while awake. While they didn’t eat any more calories than usual the day after being sleep-deprived, a higher percentage of their calories came from fat at the expense of carbs. Brain imaging suggests that the reason they ate more fat the following day was due to their fatigued brains being stressed, and searching for reward via eating more fat. Several clinical trials have demonstrated that a sleep deficit seems to cause increased caloric intake, going beyond the observational evidence mentioned in the Introduction, which can only establish correlations. One trial found over a 500 calorie per day increase in intake after depriving participants of sleep, with no change in energy expenditure. Another study yielded similar results in terms of sleep deprivation having no effect on energy expenditure. Researchers observed an increase in caloric intake closer to what was seen in the study under review, around 1000 calories per day. It also showed similar effects, in that meal intake amounts were similar, and that most of the calories came from snacks. Interestingly, the snacks that were eaten tended to be higher in carbohydrates and lower in fat than before sleep deprivation, the opposite of what was seen here and in the studies discussed below. A third trial showed that increased caloric intake due to sleep deficits leads to weight gain, indicating that insufficient sleep may indeed contribute to putting on the pounds. The phenomenon of sleep deprivation leading to increased fat intake is also pretty well-studied. One trial found an increased intake of energy and fat, specifically saturated fat, associated with sleep deprivation. Another study found that, in addition to increased fat intake, excess calories were consumed during the late-night hours while sleep-deprived. And while the current study didn’t report the macronutrient content of late-night eating, another study filled that gap and found that higher fat foods were consumed at night as well. Overall, it’s pretty well-established that sleep deprivation causes excess caloric intake. In most cases, fat is consumed in higher quantities by sleep-deprived people. This study adds a look into the brains of sleep-deprived people to the literature, which hints at the mechanism behind why the brain may crave more fat. The salience network is a brain region to watch for in future research about obesity and fat intake. Several clinical trials have established that sleep deprivation leads to a higher energy intake, often during night hours, and sometimes an increased percentage of those calories coming from fat. This trial confirmed many of these results and took the further step of providing a brain-based mechanism for why increased fat intake may occur. Cool study, but what are the practical implications? If the salience network is involved in weight gain and obesity, then, in theory, interventions that affect the salience network may limit weight gain. The research is still in its early stages on what exactly can affect the salience network, but one study has shown that mindfulness meditation alters the salience network, as well as integrates it with other networks. The practical implications of this, especially in terms of weight gain, aren’t understood well. However, the evidence so far seems to indicate that mindfulness interventions may be useful for curbing overeating. Interestingly, exercise does not seem to affect the salience network, but may affect another network called the default mode network (which is roughly what your brain does when it’s idling), which may reduce food intake as well. There is probably a lot more going on the in the brain related to food intake beyond the salience network. Neuroscience is complicated! Any advantages to not eating at night beyond fewer calories? Maybe. A recent study (abstract #0317 here) that was just presented at the SLEEP 2015 conference found that sleep-deprived people who were not allowed to eat at night were more vigilant the following day, performing better on a battery of psychological tests compared to sleep-deprived people who ate at night. In addition to fewer calories, not eating at night when you’re sleep deprived may also make you a little more alert the following day. How little sleep will lead to weight gain? This study didn’t directly explore this question, but in the introduction, the authors mention that less than six hours of sleep a night puts people at substantial risk for weight gain and obesity. However, the exact number varies a little from study to study. For instance, one observational study states that the risk is increased for people who get less than five hours of sleep per night as opposed to those who get more than seven, with no difference in risk between people who slept for more than eight hours versus sleeping seven hours. You mostly talked about the TSD group above. Anything interesting happen with the control group? Not really, but that’s a good thing. All the action happened in the sleep-deprived group, and all the major measures were performed within groups, not between groups. What the control group tells us is that nothing weird went on just because the participants were locked up in a lab for a few days, which is important information in itself. It’s perfectly possible that being under scrutiny by people in white lab coats and being fed from a fixed menu may have caused brain or dietary changes. But nothing like that was observed in the control group, which increases researcher confidence that all the changes we saw in the TSD group were really due to being deprived of sleep, and not being locked up in a strange environment for a few days. This study found that total sleep deprivation leads to more calories eaten overall, but those calories were all consumed at night. Sleep deprivation did not affect the amount of calories consumed the following day. However, it did lead to a higher percentage of those calories coming from fat, at the expense of carbohydrates. 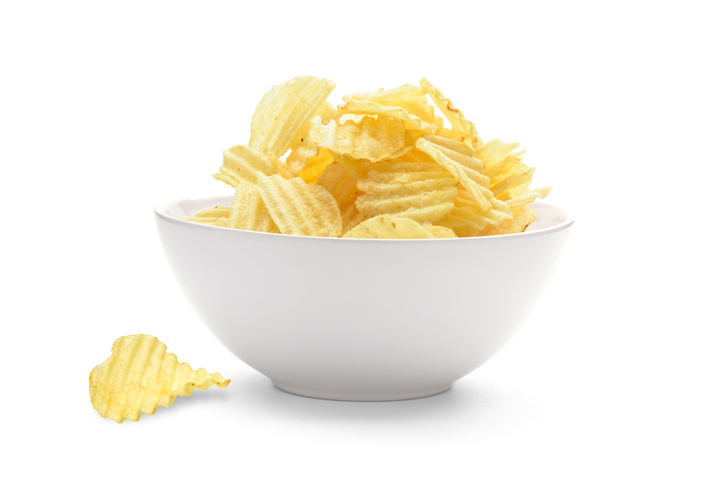 Changes in the brain’s “salience network” (regions which control what to pay attention to in the environment and what would be rewarding at a given time) accounted for the increased fat intake.